Your friendly neighborhood AppSec advisor and honeypot enthusiast. Formerly @ Goldman Sachs and Ernst & Young. Find his thoughts in code form committed to Github. If you work in Information Technology, there is no doubt you are well aware of the shift to the cloud. Startups exist in the cloud as it makes complete sense from a tactical and strategic stand point to do so. Tactically, startups can get off the ground with low cost, minimal administration overhead, and easily scale out as they grow. Even large enterprises are realizing the cost and management benefits of migrating from their datacenters to the cloud. This trend is nothing new, and the pace of cloud adoption is picking up significant speed. In my role as a Sales Engineer at Signal Sciences, I’ve had the opportunity to develop solutions for deploying the Signal Sciences’ Web Protection Platform on various cloud PaaS offerings. In this post I’d like to share some of the docker containers to bootstrap development and testing for three popular PaaS offerings: Heroku, Pivotal and IBM Bluemix. If you are curious about deploying on cloud platforms, or just getting started then these will jumpstart your efforts. For each platform there is an opensource example I provide along with some starting instructions. Anyone of course! This post will be particularly helpful to anybody that just wants to get familiar with PaaS cloud offerings. If you're an IT practitioner, developer, or information security practitioner and haven’t experimented with PaaS, now is your chance. I strongly urge the security folks (especially application security) to become familiar with PaaS platforms. You need to sharpen your skills and knowledge over these platforms to keep up with the evolving technology and development cycles. “Why?”, you may ask, watch Rich Mogull’s presentation entitled, “Tidal Forces: The Changes Ripping Apart Security as We Know it” if you haven’t already. As a technical note, to use the tools provided you should be familiar with using Git and Docker, and have both installed. For any readers that may be new to the cloud, the offerings from providers can get confusing fairly quickly. The common terms you will see and hear are Infrastructure as a Service (IaaS), containers, and Platform as a Service (PaaS). Note, some may consider “containers” a type of PaaS offering. If you’d like to dive deeper on these topics, see Service models on Wikipedia. And if you really want to go further, also get familiar with the various Deployment models as well. 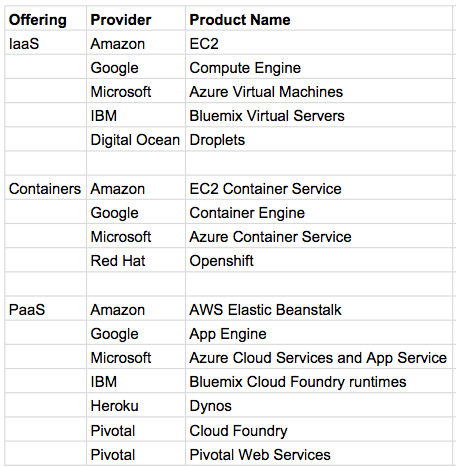 However, the goal of this section is to keep it light, so I just want to provide a mapping of the cloud terms above to product names from the major cloud providers. You will find this useful when trying to navigate all the different service offerings. Ok, let’s jump straight to it. PaaS solutions make it easy to get started as you can setup a free account, and they provide sample applications to get you going with your first deploy. The three primary PaaS solutions, IBM Bluemix, Pivotal Web Services (PWS), and Heroku use a concept called buildpacks. Buildpacks are composed of a set of scripts that automatically setup the environment depending on which language you select. For example, to deploy a PHP application you would select the PHP buildpack. All you have to worry about is the application code itself. For each PaaS solution below I’ll provide a brief description and a container that sets up the tooling needed to get started. These really are simple containers, and they are convenient to spin up when you want to work with any PaaS solution. One advantage to using these containers is you don’t have to pollute your computer with a bunch of tools or dependencies. Next, see the “Getting Started” section of the readme file. Next, you can jump to the Deploy the Sample App step of the Pivotal tutorial. Next, reference the “Getting Started” section of the readme file to select which language you want to get started with. I hope the tooling I provided helped you successfully deploy a sample application to at least one of the PaaS offerings above. Moreover, I hope this has demonstrated how easy it can be to deploy applications in the cloud. Many developers as well as enterprises have recognized the benefits, and they are pushing to migrate their applications to these and other PaaS offerings. I think it is safe to expect this trend to continue, and perhaps your next project will add to the trend! The Signal Sciences’ Web Protection Platform protects modern applications, microservices and APIs from real attack and threat scenarios, and can be deployed in any infrastructure and technology stack.